Living as a Khan, a great ruler in Mongol times would mean that your position of power would likely attract unwanted attention. The Mongol Kheshig was the solution to this problem for many Khans. An elite unit of bodyguards for the Khan, the Kheshig were the most trusted, the most skilled and the most loyal Mongol warriors of all. In effect the Mongol Kheshig were the imperial guard for the Mongol Khan, or for the royalty of the Mongol empire. Their job was to protect the Khan and the rest of the current royalty, and membership was reserved for the most trusted Mongol warriors. So important was the role of the Kheshig to the Khan, that the Kheshig would work shifts ensuring adequate protection was provided night or day. The need for the Mongol Kheshig is obvious, power always draws temptation from man, and rulers like the Khan were an obvious target for disgruntled allies, enemies and spies. The need for a trusted guard like the Kheshig becomes obvious and we will explore the introduction of this elite group of warriors in further detail as we progress. 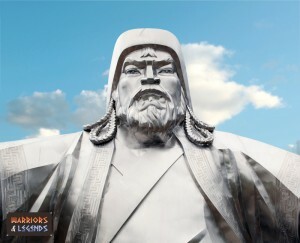 First used by the legendary ruler of the Mongols, Genghis Khan is the man responsible for the creation of the Kheshig back in the start of the 13th century around 1203. Of course Genghis’s father was actually poisoned, and any position of power especially the Khan would draw a vast amount of unwanted attention and a potential threat to life. Ghengis Khan was a firm believer in his bodyguards the Keshig. The formation of Genghis’s kheshig came about after his defeat of Wang Khan. 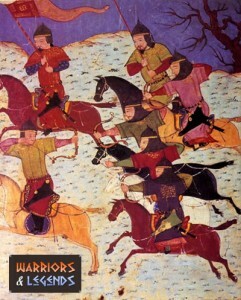 Wang was responsible for an assassination attempt on Genghis life, and was later killed in retreat after his forces were defeated by Genghis’s army. Since this time, the kheshig were assigned to the day and night protection of Genghis and the other royals. As we previously mentioned earlier, becoming a trusted member of the Khan’s bodyguard was not an easy feat. In the time of its creation by Genghis, the Kheshig was first and foremost only open to Mongols or Turks. This was obviously for trust reasons, but uniquely enough in time, with later Khans many nationalities were accepted with the growth of the Mongol empire. The Kheshig was also one of the most highly paid positions available to any Mongol warrior. Because of this competition was fierce and loyalty was a must to retain this esteemed position. The Kheshig was split into two shifts in essence, the day shift and the night shift. Which was the easier shift we’re unsure, in the day you would likely have to be alert, move around a lot and likely be more active. The night guard were hampered by the darkness of course, and assassination attacks were likely more common, but the shift was likely less tiring and generally quieter. One thing we are unaware of is whether the shifts swapped over at some point. Did the day guard work days for a week then switch to nights? One fact we do know is that the two units or guards were called the Torguud and the Khevtuul. A Keshig protector their Khan. The Torguud were the day guards in the Kheshig. Responsible for staying close at hand at all times during light hours, the Torguud would likely have to work hard to ensure the safety of the Khan and the royals. The Torguud we’re believed to have stared off at humble beginnings with around seventy guards on shift at once. The Khevtuul were the night shift of the Kheshig. Designated to keep a watchful eye on the safety of the Khan and the royals at night, the Khevtuul likely had a less tiring shift, but perhaps fraught with more opportunity for raids or stealth attacks. One think the Khevtuul did have to guard for at night was someone trying to murder the Khan through the walls of his Ger. To ward off this attack the Khevtuul were said to have marched round the outside of the Ger all night. The name given to the bodyguards of the Khan, the Kheshig also sometimes spelled as Kheshig are sometimes confused with the Khishig. The Khishig infact were the royal palace guards of the Mongols who ruled in India. Another variation of the word Kheshig is the Keshikchi who were the night guards of the Mongol royals who were situated in Persia. To be a member of the Kheshig as we have mentioned previously was a high honour and not only brought respect from your peers but it also brought power. Legend tells us that a single member of the Kheshig could overrule a Mongol commander if necessary such was their power and authority. What is interesting about the power granted to a member of the Kheshig is why the option to overrule a commander was there. Was it because they were so highly considered, or whether as a protector of the Khan it was important for them to be able to overrule maybe a commander or officer who was potentially a threat to the Khan. Whatever the real reasoning behind the power of a Mongol Kheshig warrior does not affect just how highly regarded they were. For a Mongol warrior, to join the esteemed Kheshig was the ultimate honour. To defend the Khan night or day, dark or light, this was their job and their only focus. Not only did the Kheshig garner immense respect they were also granted extreme power, with the ability to overrule a commander should his decision not suit them.